Not long ago, our pastor prayed specifically for a person who was contemplating ending their life. 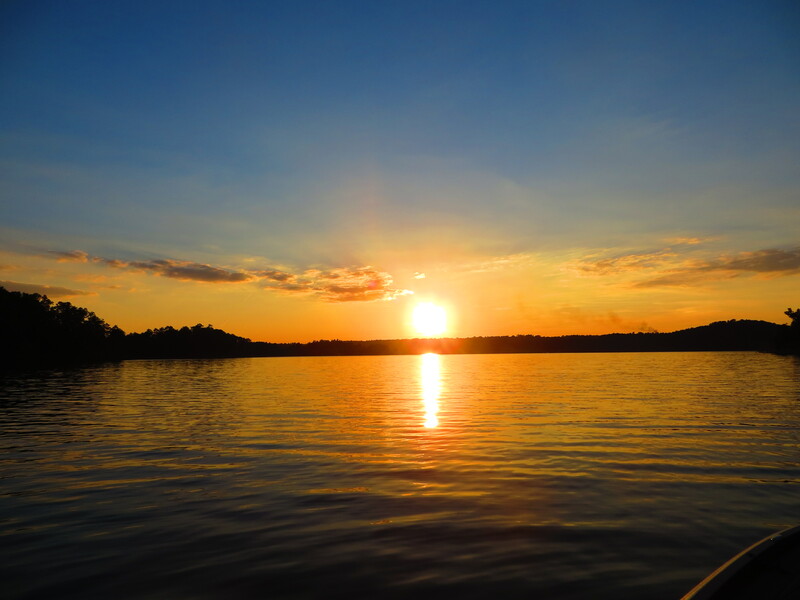 His prayer jolted me back to a time when I found myself in a state of desperation in my life. I had experienced a time of hopelessness after a divorce. I found myself sitting in a yard sale chair, in a borrowed house, with a loaded pistol! God sent my mom to knock on my door in that lowest moment. I thought I had nothing; I thought I had lost everything! But God never left me; He was there for me as soon as I turned to Him. That day I began to dig my way out of the pit of despair. Depression is real and brutal. There is no shame in seeking counsel. Without the counsel I received, I would have most likely found myself repeating the cycle of desperation, loneliness, and self-destruction. I’ve been there … financially depleted, emotionally broken, self-medicating with alcohol. At one point, everything I had was gone! God. I told God everything that had happened. In my mind I visualized myself taking all my problems from my past and all my desires for my future, and I piled them up and gave them to God. He accepted my piled up problems and desires, and I made a choice to quit trying to control my life. I chose to trust God with my past, my present, and my future. God changed me that day! He took my broken life and replaced it with a life that was full of hope. He redeemed my life by giving me a second chance. It didn’t change my past … I still had to deal with divorce and the loss of my material possessions. But I felt hopeful about my future. I believed that with God’s help, I could rebuild my life. But this time, I wanted to rebuild it according to His instructions in the Bible. Slowly, joy returned to my daily life. Are you in a “pit of despair”? Don’t hide! Cry out for help. Allow God’s Word, the Bible, to speak to your deepest need. Father God, please give your HOPE to each person who reads this testimony. Give the reader Your spirit of LOVE, POWER, and a  SOUND MIND. Provide healing from the hurts of the past, and    give a glimpse of the plans for GOOD that you have for them. Help each individual believe that these are good plans to give them a FUTURE and a HOPE! Amen. This is the final post in a six-part series describing the people we met on a mission trip to Guatemala. We struggled to say goodbye to these faces that have been etched permanently into our hearts and minds. We promise to pray ... we long to return. A group of our team went from home to home in the poorest part of the village and allowed the villagers to choose a fruit tree. The tree was planted in the rock-solid soil in their yards. The villagers eagerly chose from the lemon, coconut, mango, or orange trees. They stood by with pots or buckets of water to pour on the tree as soon as it was planted. This small gift meant so much to these families! After the tree was planted, the GFBC team gathered near the home of the family and shared the Gospel – the reason we planted the trees. We shared the story of our heavenly Father who loves them enough to provide fruit trees, medical care, and food. The people eagerly put the salvation bracelets on their wrists. The team prayed with each family, begging God to bless these families and allow them to truly know His love. This was repeated over and over … family by family … the trees were planted, the Gospel was shared, and the families gathered to pray. God was very near! He was glorified! We had the oppo rtunity to worship in the church that was built last summer. What a joy to see the women and children fill the seats inside the open air facility. Boys climbed a tree in the back of the church and perched on a tree branch as their “church pew” during the service. Other boys climbed into the back of a pickup truck and worshiped from there! The sounds of babies and children filled the air. Some toddlers were allowed to walk around during the service. But the people listened and responded, and God was near to us. As the music began with guitars strumming and voices raised in praise to our God, we were reminded that it’s not knowing the words or knowing the melody that defines worship; it is our hearts in unity before the Father creating that sweet fragrance of pure worship to our King JESUS. As we sang, we recognized a few phrases … Cristos … Alleluia, … but we recognized much more than words. We felt the Spirit of God moving in a mighty way and tears swelled and spilled onto my cheeks. Worshiping God in Guatemala was pure … It wiped all the surface clutter out of the way, and we were escorted into HIS presence to stand before our God! Our total focus was on Him! It was a very good feeling to be standing in worship, staring into a landscape of magnificent mountains, hearing the beauty of the different language encircling us, and recognizing that God is with us there! In fact, He had drawn us together and as we drew near to Him, He surrounded us with His presence. We experienced pure worship! While serving, our pastor was asked if he would baptize some young men at Kelley’s Place, the home for special needs children. He was thrilled to agree! Kelley’s Place has a therapy pool, and the physical therapist met us there to baptize the boys. It was an amazing time of seeing the joy on the faces of these two teens who had limited mobility. The boys were in wheelchairs when we arrived. They could not walk or sit up, so they were placed on an aqua mat. Pastor Mark and the therapist went into the pool, and others helped to lower each boy lying on the mat into the water. Each came out of the water smiling! What an amazing sight!! Their joy was evident without the need for words! “NOW LISTEN TO THE EXPLANATION OF THE PARABLE ABOUT THE FARMER PLANTING SEEDS: THE SEED THAT FELL ON THE FOOTPATH REPRESENTS THOSE WHO HEAR THE MESSAGE ABOUT THE KINGDOM AND DON’T UNDERSTAND IT. THEN THE EVIL ONE COMES AND SNATCHES AWAY THE SEED THAT WAS PLANTED IN THEIR HEARTS. SEED ON THE ROCKY SOIL REPRESENTS THOSE WHO HEAR THE MESSAGE AND IMMEDIATELY RECEIVE IT WITH JOY. BUT SINCE THEY DON’T HAVE DEEP ROOTS, THEY DON’T LAST LONG. THEY FALL AWAY AS SOON AS THEY HAVE PROBLEMS OR ARE PERSECUTED FOR BELIEVING GOD’S WORD. BUT ALL TOO QUICKLY THE MESSAGE IS CROWDED OUT BY THE WORRIES OF THIS LIFE AND THE LURE OF WEALTH, SO NO FRUIT IS PRODUCED. Father, we’ve planted and done our best to represent you in Guatemala. Please bless our efforts and produce a harvest in Antombran. We give you praise and honor for the opportunity to serve You and to serve these precious souls. Continue to bless them and provide their needs. Amen. 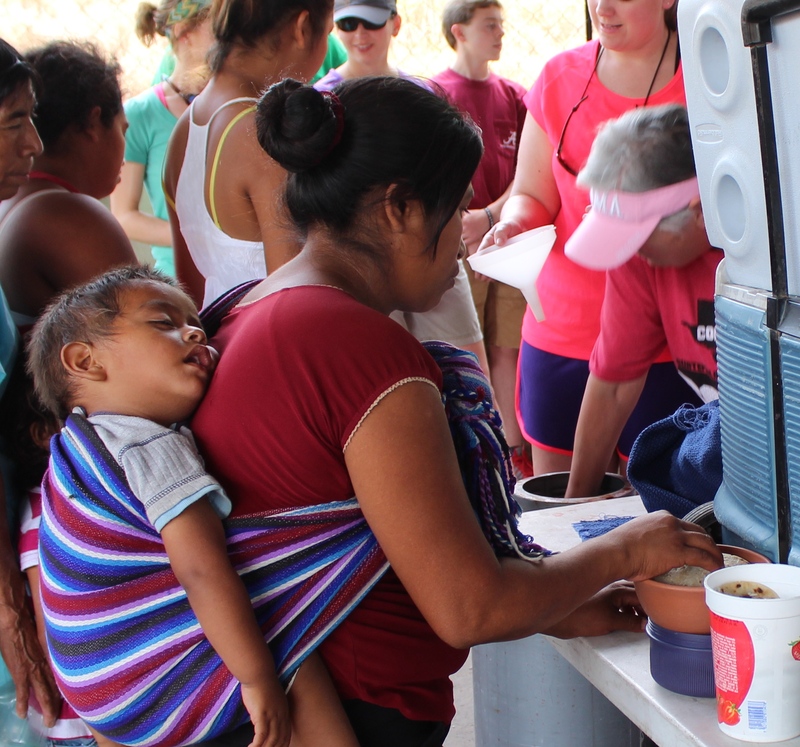 This is the fifth post in a six-part series describing the people met on a mission trip to Guatemala. Lives were changed ... We, the Americans, are forever changed!! Before sunrise the four joined employees of Hope of Life who spend their time building relationships with these families, and began their trek high into the mountains of Guatemala. After three hours of bumpy roads and walking a trail by foot, they arrive at the home of the infant. They find Kaylene Roxanne, a five-pound three-month-old, surrounded by a loving mother and her sister, Rosie. The mom was doing all she could for Kaylene, but she w as not thriving and growing. During this rescue the team also met Oscar, a seven-year-old in need of medical care . Oscar’s hair was dry, brittle, and falling out, with a washed-out yellow tent. Oscar’s mom had several other children to care for and she struggled with allowing him to leave her. Finally, she trusted Hope of Life with her son and sent Sara, his 13-year-old sister to be with him. Oscar had such sweet faith as he left his mom and grasped Tammy’s hand, allowing the team to lead him and Sara down through the mountains, and several hours away from mom and home! Five sweet souls were rescued that day … Kaylene, Rosie, their mom, and Oscar and Sara. The faith and trust these families had in our team will never been forgotten. It’s amazing to these Americans that the families trusted us (strangers) enough to leave their home and come with us. The people are desperate for help! Praise God for His faithfulness in providing for these children. God is good! All the time!! Our mission team spent one morning measuring and packing 300 bags of food to distribute to the people of our adopted village of Antombran. The rice, dried beans, and dried corn had to be measured and bagged. After that, the rice, beans, and corn were combined with sugar, corn flour, a soup mix, a protein powder, and coffee. 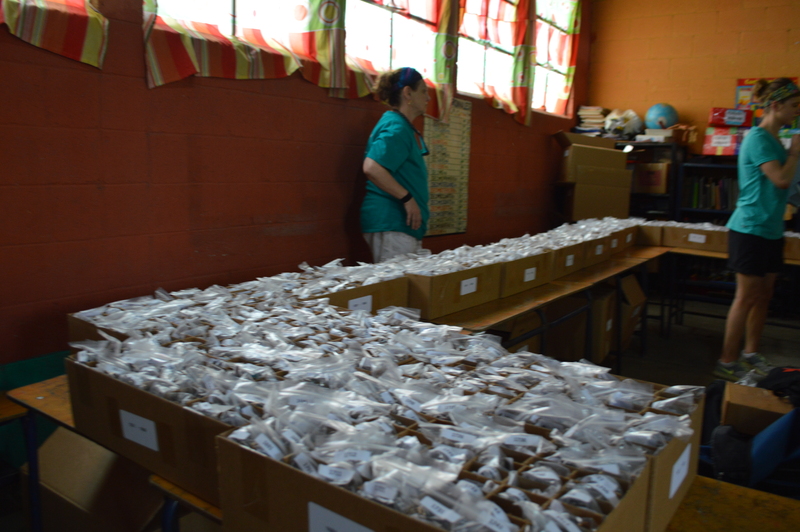 Later in the week, we loaded the food bags into a truck and the back seats of our school bus, and then in the village unloaded the bags – each weighing 25 pounds! 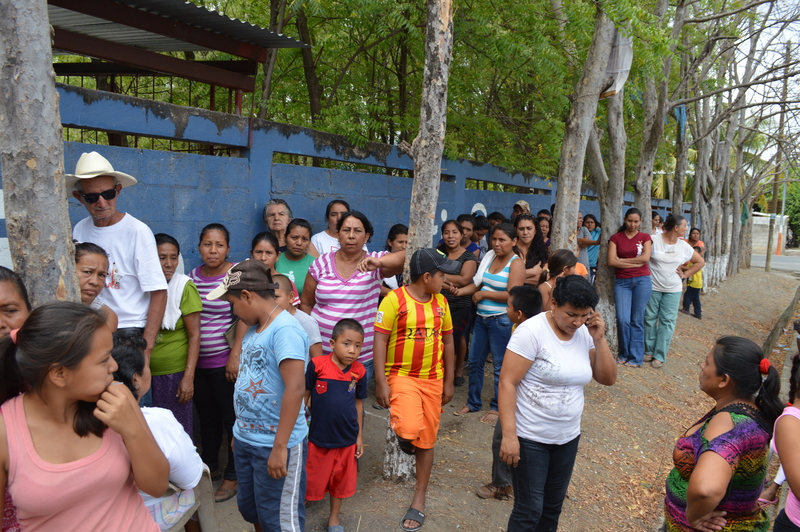 The villagers lined up for hours waiting to receive their food bags. These bags would feed the families for 6-8 weeks. It was definitely a festive atmosphere as the villagers anticipated receiving the bags of food! As the foo d bags were placed in the hands of the people, they were hugged and told, “Jesus te ama” (Jesus loves you!) or “Dios te ama” (God loves you!). We received lots of smiles, hugs, and many returned our blessing saying, “Alabado sea Dios!” (Praise God!) or “Que Dios te bendiga” (God bless you!). Father, our hearts hurt as we leave our village today! We have worked hard to accomplish the jobs you have given us to do, but there seems to be so many more needs. Please bless the people of Antombran and continue to provide for their needs. 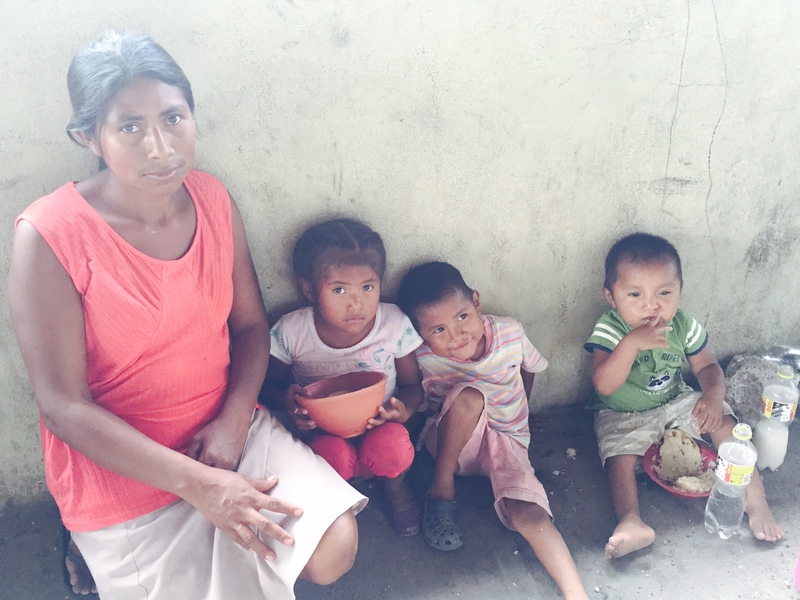 Bless Hope of Life and allow them to continue to meet the needs of so many in Guatemala. Continue to use us, Lord, to love your people and point them to Your eternal love. Amen. This is the fourth part of a blog series that introduces you to the men, women, and children we met while serving the LORD in Zacapa, Guatemala. During our week we offered two clinics. The first was a basic medical check-up done by our three nurses and a local medical doctor. As a part of this clinic, we had a pharmacist able to give needed medications, vitamins, and over-the-counter medications. Moms brought children with coughs and infections to be examined by the doctor. Our GFBC family provided the funding to purchase antibiotics in Guatemala, and we shared these antibiotics with families in need. Eye drops were given to help with itching eyes and allergies. A young boy received inhalers to help him breath. A little girl had a severe throat infection … a throat more infected than our RNs had ever seen! Antibiotics were given. Needs were met. The second clinic was a vision clinic which evaluated eyesight and offered eyeglasses to the people. A blind woman was led by her daughter and waited for hours to see if glasses would help her see. We prayed with her asking the LORD to meet her needs. Another eighty-seven-year old woman walked alone with a wooden cane from her home, waited patiently to see the medical doctor and then waited longer to have her eyes examined. 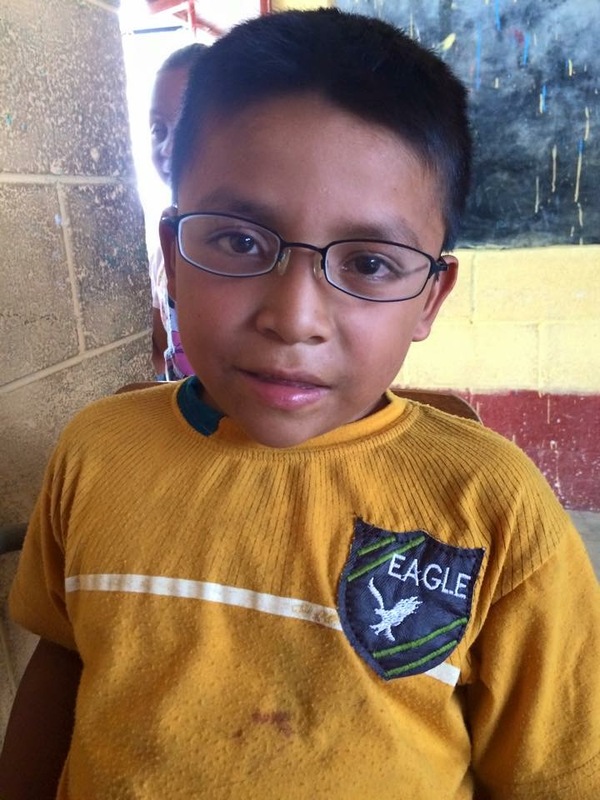 She was thankful to receive glasses! A nine-year-old jumped in awe as glasses were put on her and she could see! Lots of smiles … Lots of “gracias” … Many happy hearts!! his lady perfectly and allowed her to see clearly! We rejoiced and felt that our sweet LORD had turned the water into wine again … this time making the men’s glasses become women’s. Lots of children came to the vision clinic alone, without parents. One of these was a young girl named Wendy. The vision team recognized that Wendy had a lazy eye and needed to wear an eye patch to strengthen the eye. Katie , one member of the vision team, had a lazy eye as a child, so she was intensely interested in helping this child. Katie, her husband Reid, and an interpreter made several trips walking to Wendy’s home to explain the need to her mom. At first little Wendy was not happy to wear the patch, and her mom did not understand the need. After Reid patiently demonstrated to the mom how covering one eye could straighten the lazy eye, the mom excitedly agreed to use the patch. Little Wendy fell in love with Katie and spent the rest of the day with her at the vision clinic. Katie and Reid experienced such sweet moments of loving on this family and reassuring this precious girl that God made her perfectly beautiful in His eyes. We look forward to returning to see little eyes that move together and look at us straight-in-the-eyes! came without parents and told us his eyes hurt. One of our RNs went with an interpreter to his home to give his mom eye drops, and to teach her how to administer the drops. When they arrived, the fire the family used to cook was right outside the front of the house, and the smoke was constantly coming into the home. This is a common problem in Guatemala! We spoke over and over about how important it is to keep the children away from the smoke from the fire as much as possible. Imagine your life without glasses!! Imagine if you had cataracts but had no way to receive surgery!! These people were so happy to receive a pair of glasses. In some cases, we had to show the people how to balance the glasses on their ears and noses since they had never put on a pair of glasses!! In one case, a woman had a cataract in one eye and glaucoma in the other. She cried as she told us there was free cataract surgery in the capital city but she had no money to pay the transportation to get there. She lived alone and fears that she soon will be blind. We were able to take her name and address to the Hope of Life leadership, offering to pay the transportation costs to get her to the city.